Weather: Mild, Clear Evening with Occasional Cloud. The first Waharau for 2008. All week the forcast looked poor for the weekend, however, late on Friday afternoon it cleared. 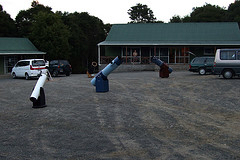 So I headed off to Waharau Regional Park, the location for the Dark Sky Weekend hosted by the Auckland Astronomical Society. I arrived at 4:15 pm and promptly settled in. 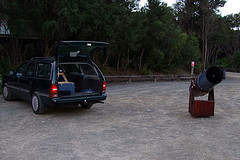 Set the scope up early and waited for the sun to set and the cloud to clear. Both event's happened. I still had plenty of objects loaded in the Argo Navis, and a good nights observing was expected by the few that turned up. Circinus Dwarf Galaxy. Small galaxy that is tucked inside the 'V' of a 'Y' shaped asterism. Fairly conspicious but without detail. Hartungs Object. Waharau Autumn 2008. Moderately bright and not difficult PN. Early Evening Object Waharau Autumn 2008. A diffuse nebulous patch below a dark streak. 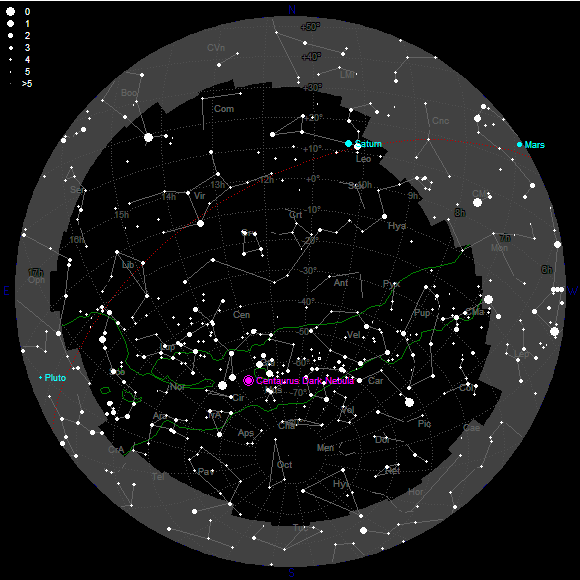 A 'C' shaped asterism is in the FOV at 7 o'clock. A loose open cluster of about 40 to 50 stars. No more than a starry knot in the Milky Way. No bright members. Waharau Autumn 2008. Open Cluster of about 20 stars, surrounding a 5th mag star. Waharau Autumn 2008. Small, but bright globular cluster well resolved with a strong core. Possibly type 2. Waharau Autumn 2008. A small nebulous spot surrounding a 10th Mag star. Not enhanced by the UHC filter. Waharau Autumn 2008. Spiral Planetary. Irregular in shape and brightness. Should push the power up and look at the PN in even more detail. Top Object. Waharau Autumn 2008. Small stellar PN, confirmed with Filters and Star Chart. Waharau Autumn 2008. Small faint galaxy with an even brightness. No features of note. Waharau Autumn 2008. Small Oval shaped galaxy with a condensed core. A little irregularly noted. Waharau Autumn 2008. The 'Son of Sombero' Bright and long (6:1), with a dark lane. Irregularity noted. Waharau Autumn 2008. 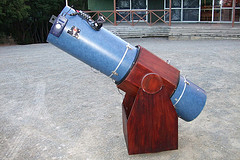 Ara Globular. Beautiful, Well resolved and bright. Waharau Autumn 2008. Bright Messier globular. Well resolved despite being low in the N. Contrast not as good as it could be, but a nice view none the less. Waharau Autumn 2008. Large Messier globular, moderately bright but not fully resolved. Waharau Autumn 2008. A large 10:1 edge-on galaxy, with a dark lane. Bright and not too bad for contrast. Waharau Autumn 2008. Bright slightly oval Messier glaxy, even in brightness with a dark patch near the core. Waharau Autumn 2008. Bright and round Messier galaxy with no real detail. Has a very similar looking comapnion NGC4394, albeit fainter. Waharau Autumn 2008. Bright round PN next to a bright star 10th mag star. Almost the same brightness as the star however it is definately Non-stellar. Waharau Autumn 2008. Small round galaxy with no real apparent detail. Smaller brother of the Messier 85 galaxy in the same FOV. Waharau Autumn 2008. Diffuse large galaxy with a small core. Round with a large halo. 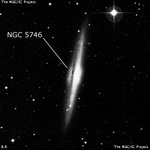 Has a compainion at 2 o'clock NGC5363. Waharau Autumn 2008. Small oval galaxy with a bright core. Near a larger but fainter galaxy NGC5317 aka NGC5364. Waharau Autumn 2008. Shapley 1. Fairly difficult without the use of a narrowband filter but this object responds very well to the UHC and OII Filters. Waharau Autumn 2008. Menzel 2. Distinctive and conspicious. Box shaped and fairly large (60'). Easier with the UHC Filter. Waharau Autumn 2008. Large Dark Nebula in Centaurus. A round large dark nebula that fills most of the FOV. Waharau Autumn 2008. I did another long TPAS run on the Argo Navis and had a good play with the different terms in the pointing model such as CA and NPAE. I am still learning the art of the TPAS but so far it works well. As with Matarangi, the previous week, I did a full horizon survey of horizon at Waharau . Horizon Map taken from Astroplanner on the right. It is always good to catch up with the bright objects as people come and have a look through the scope and look at those Southern favourites, and a few Northern ones as well!! Didn't log a lot of objects I am sure I looked at a few others, but my aim was to just enjoy a night out with some observing mates and catch a few objects that I had not logged before. Cloud punctuated the evening but there were good long patches of clear sky before midnight and a few short ones after midnight. The cloud rolled in for good at 1:30 PM and by 2:30 PM I had called it a night.